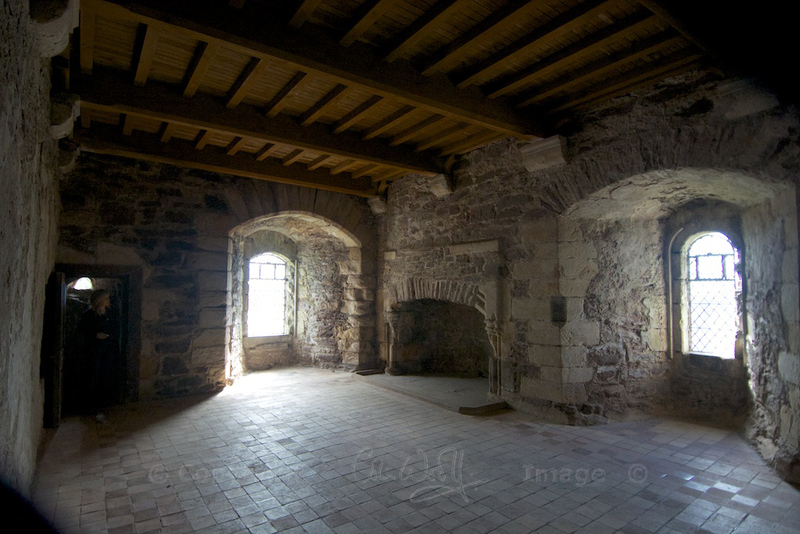 Standing in one of the grand bedchambers at Doune Castle, gazing through the window at the beautiful woods that lead down to the River Teith, it’s easy to imagine yourself as a guest here in the 15th century; the room feels welcoming, despite its bare stone walls and shadowy recesses. But 600 years ago there would have been a fire crackling in the hearth, the walls would have been draped with rich hangings, and after your long ride you were probably looking forward to a good night’s sleep in the large canopied bed; meanwhile you would have heard the bustle of servants in the kitchens below, preparing food for a lavish feast that would be served that evening in the Great Hall. 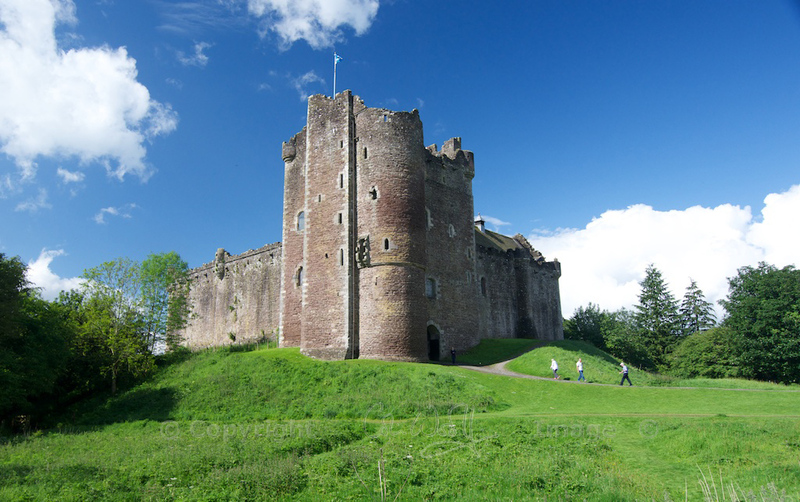 Roman artefacts have been found on the site of Doune Castle, and the very name ‘Doune’ is derived from ‘dun’, meaning ‘stronghold’ (in fact, duns were similar to brochs, but are believed to have been designed on a smaller scale). There has probably been a fortress here since early medieval times, but little evidence of that remains. 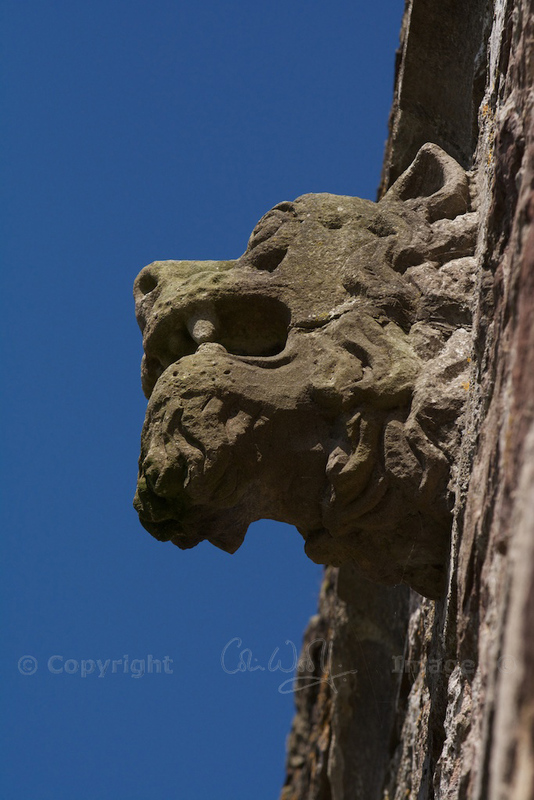 When we walk around Doune today, staring up into the yawning roof of the Great Hall or treading carefully around the tightly winding stairs, our impressions are dominated by the efforts of one colourful and formidable figure: Robert Stewart, 1st Duke of Albany. Born around 1340, Stewart was a great-grandson of Robert the Bruce, and he seems to have inherited his ancestor’s stop-at-nothing attitude in his lifelong quest for power. A younger son of Robert II, he didn’t let the rivalry of his many brothers get in his way. Earl of Menteith, Earl of Atholl, Earl of Fife, Constable of Stirling Castle… he collected titles like a magnet collects iron filings, and by his early forties he was Chamberlain or chief financial officer of the realm. Not content with that, he soon exploited the weaknesses of both his father and his older brother to secure for himself the guardianship of Scotland. Seeing his brother crowned as Robert III on his father’s death can’t have come as a surprise for Stewart, but he still found it unacceptable. And how inconvenient that his brother had two sons, David and James, who were poised to step into his shoes. Stewart had been created Duke of Albany, choosing for himself a name that reflected the ancient Pictish kingdom of Alba, but he obviously felt that he was running the country while receiving no recognition whatsoever. With Robert III suffering from ill health, David began to assume the mantle of power and started throwing his weight around. This was too much for Albany, and in 1402 he ordered David’s arrest. He imprisoned his nephew first in St Andrews and then at Falkland Palace, where he died – according to reports, from either dysentery or starvation – at the age of 24. A ruthless uncle and the sudden and mysterious death of an heir to the throne. Ah, Richard III, does this ring any bells with you? And where was David’s younger brother, James? He was being held captive in England, a hostage in the court of Henry IV, where he was receiving a good education and absorbing the English ways of life. In fact, this period of captivity might have saved him from a similar fate. In 1424, four years after Albany’s death, James was finally ransomed and returned to Scotland, where he was acknowledged as King James I. So Albany never did sit on the throne of Scotland, although he must have been so close that it felt warm to touch! He died in September 1420 at Stirling Castle, leaving his ambitions in the rather less-than-capable hands of his son, Murdoch. James I, newly returned to his kingdom, wasted no time in executing Murdoch and seizing the grand castle of Doune for himself. Cynically, you’re tempted to think, “Well, you would say that – you’re an Abbot!” It’s possible that the people who held lower opinions of Albany didn’t actually survive long enough to express them. From the design of his castle, which he built in the late 1300s, all we can tell is that he entertained on a grand scale, and that he was expecting some unwelcome visitors as well as the ones he’d invited. 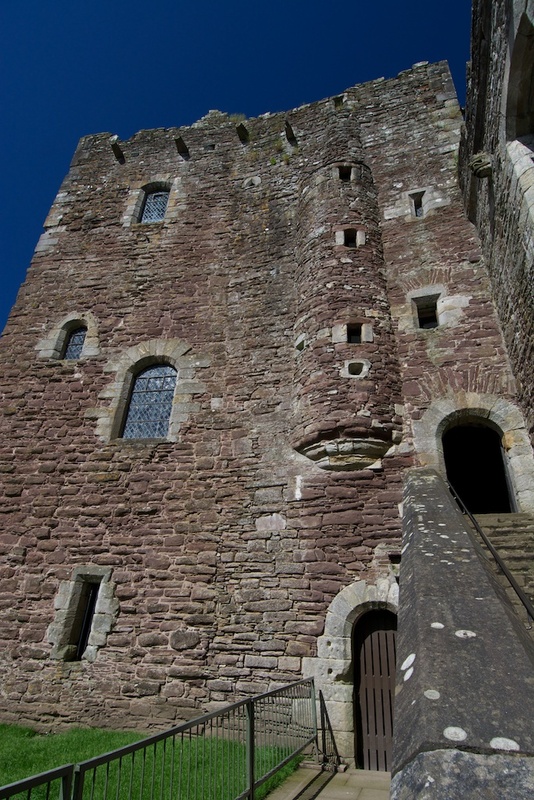 Once in the hands of James I, Doune Castle was transformed into a hunting lodge, and as a desirable royal retreat it was included in the marriage dowry of successive queens. At this, Albany must have been churning in his grave. If his ghost doesn’t stalk the rooms any longer (and I can find no evidence that he does), then it must be because he used up all his energy in haunting his surviving nephew. 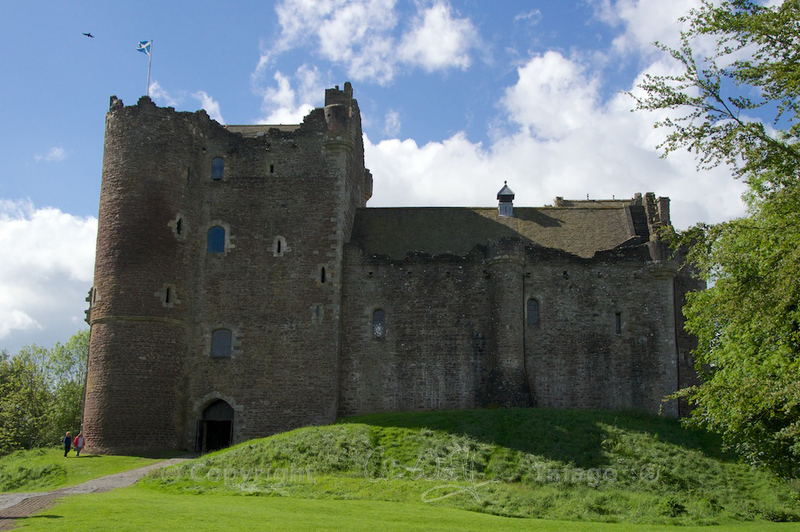 Doune Castle is now one of the filming locations for the TV drama series ‘Outlander’, based on the books by Diana Gabaldon. 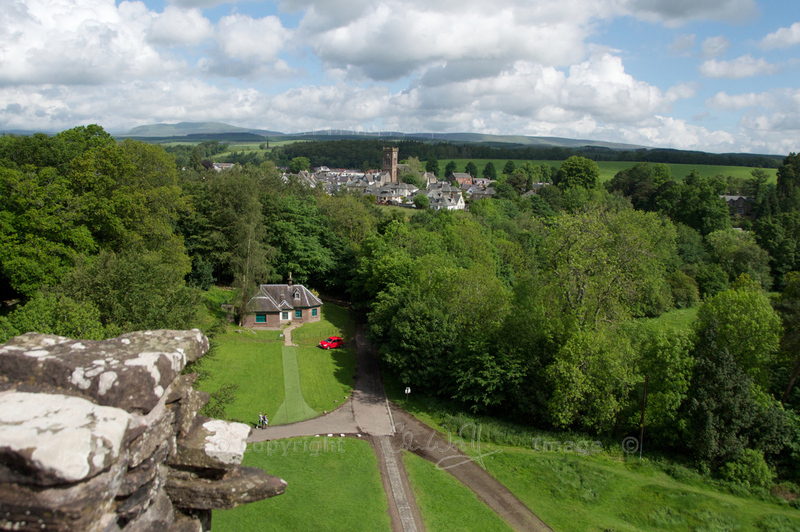 It doubles as Castle Leoch, the seat of Clan Mackenzie. In 1975 Doune Castle welcomed the cast of ‘Monty Python and the Holy Grail’. 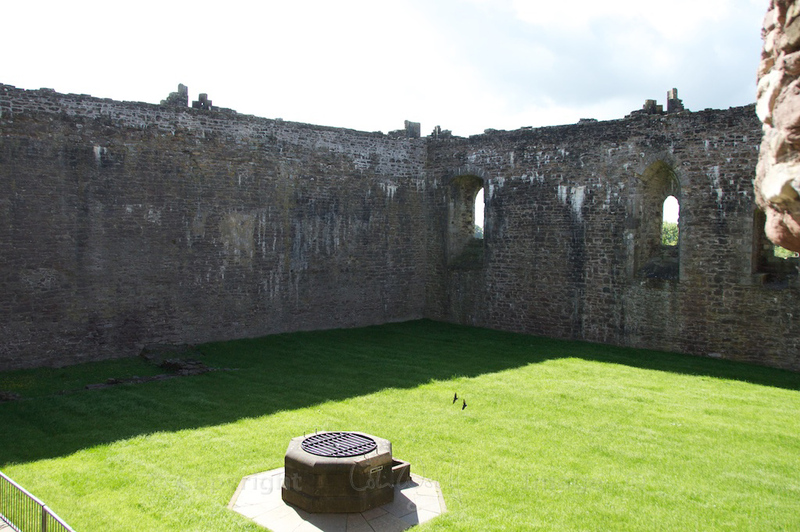 Scenes were filmed in the kitchen, the courtyard and the Great Hall, where they staged their famous ‘Knights of the Round Table’ song and dance scene. During filming, visitors were apparently persuaded to dress up as extras. That would have been fun! 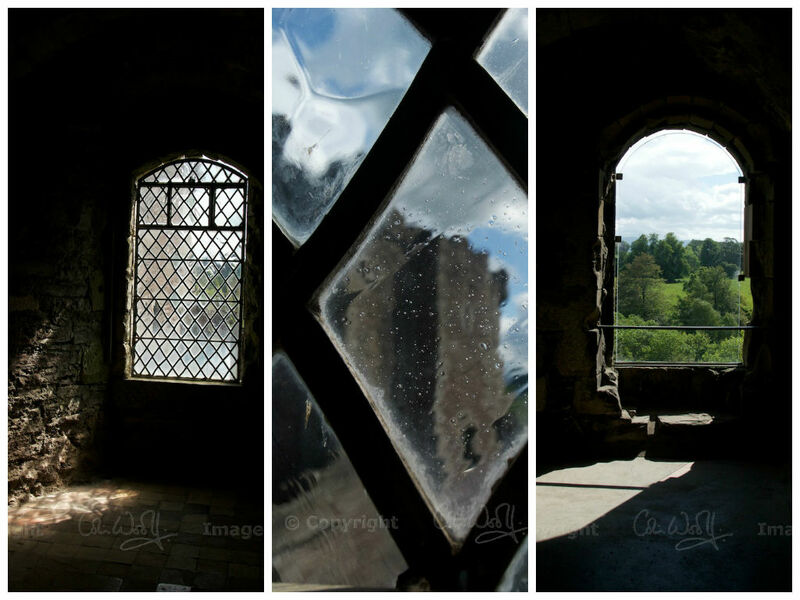 Doune is the quintessential Scottish castle, and it’s a joy to explore. 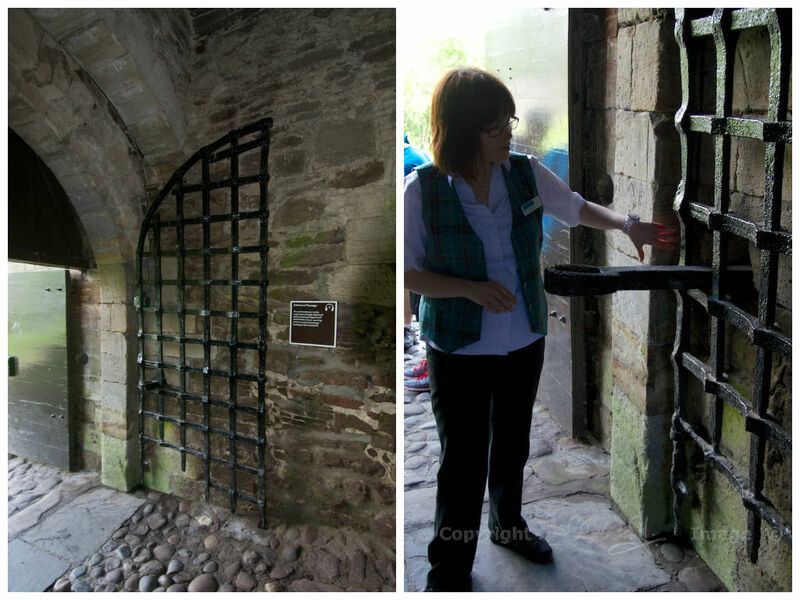 At the entrance, the iron gates can still be bolted with the massively heavy drawbar which is pulled from a recess in the wall. Through a dark passageway, bordered on either side by small chambers that may have been guard rooms or prisons, you emerge into the bright sunshine of the courtyard with its high curtain walls. Now a grassy area, it would once have been cobbled or just a dirt surface. Historians now believe that there would have been more buildings in the courtyard, simply to house the large number of guests that are known to have stayed here. In the dim recesses of the kitchen, the remains of a massive fireplace hint at the quantities of food prepared here. It must have been a searingly hot place to work. Through the arched hatches, cooks passed dishes of food to servants who carried them into the Great Hall. There are even cut-marks in the walls where the kitchen staff sharpened their knives. Does this window look familiar? The ‘Knights of the Round Table’ were standing here in the Monty Python sketch! From the kitchen it’s only a few steps to the Great Hall, and this takes your breath away. There is no furniture, apart from a lonely table and chair at the far end. An iron brazier marks the site of the original central fireplace. Diffused light pours in like some opaque liquid through the latticed windows and onto the crumbling stone sills. The glazing isn’t contemporary, and the roof has been restored in later centuries, but in a way it still feels as if it’s waiting for more guests to arrive. 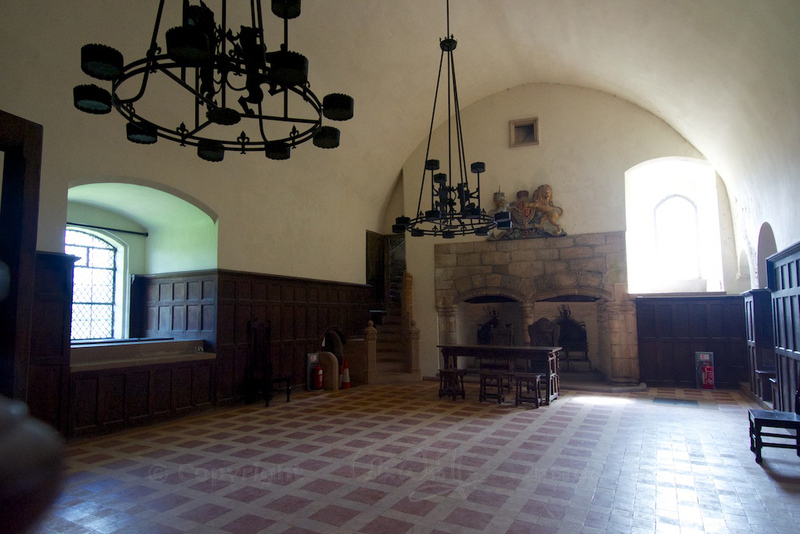 Just off the Great Hall is a smaller chamber known as the Duke’s Hall, where the Duke of Albany could have dined in private. (To my mind, he doesn’t sound like a private, retiring kind of guy, embarrassed about how he drank his soup.) This is where he may have conducted business, receiving visitors seeking his consent or patronage, and dispensing justice to prisoners (justice may have been immediate, as a pit-prison lay beneath the floor). This chamber has been refurbished by successive generations, and it contains lots of embellishments that the Grand Hall lacks – but I think it also shows that you don’t always need to ‘restore’ something in order to preserve its character. 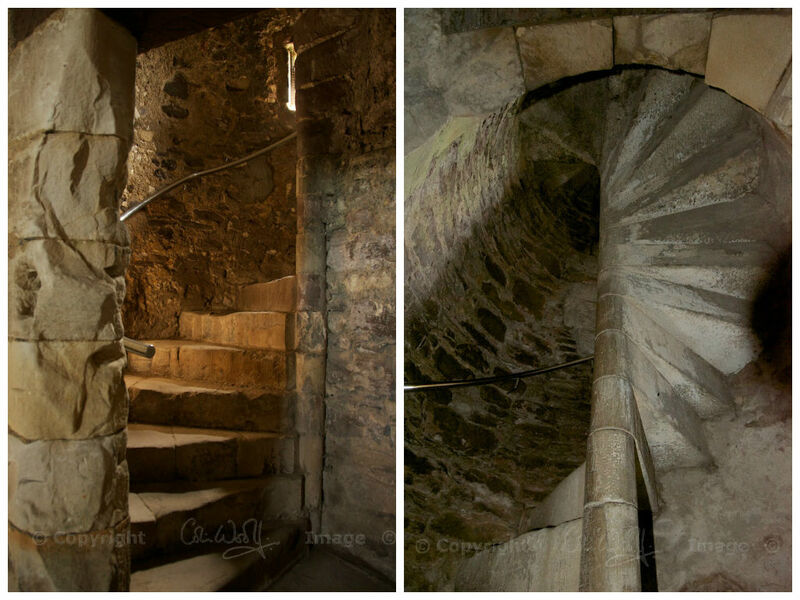 Inside the Gatehouse Tower and the Kitchen Tower, spiralling stone stairs lead you upwards with the promise of silent rooms and dark poky corners. The upper rooms of the Gatehouse Tower include the high-status private apartments of the Duke, and a small oratory with a piscina. Finally, you emerge onto the battlements, where you can gaze out towards the hills and watch the river slowly meandering between its wooded banks. From the castle, a path leads down towards the Ardoch Burn, a tributary of the River Teith. On the way, you pass a small stone-lined cavern that may have served as a cold store for the kitchens. Standing by the curve of the river and listening to blackcaps and wood warblers singing in the warm sunshine, you wonder whether the Castle’s servants would have stolen down here for a few minutes of utter peace. 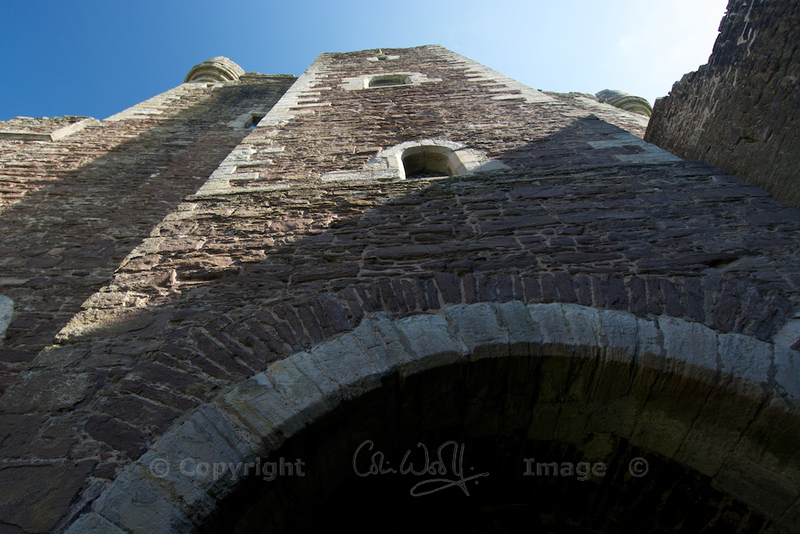 Doune Castle is in the care of Historic Scotland. It’s open all year round (times are more limited in winter) and at the time of writing the admission charge for one adult is £5.50. The village of Doune lies on the A820 just east of Dunblane in Stirlingshire, and about 6 miles north-west of Stirling. You need to turn off in the village and follow the signs to the castle. There’s a car park just outside the grounds. Or, if you’re a Python fan, take a look at Castle Stalker, otherwise known as the Castle of Aaaaaargh! It looks wonderful. The idea of a “Mary Queen of Scots” bedroom made me smile though – I don’t think there is a castle in Scotland that doesn’t claim to have one, whether she can be shown to have stayed there or not…I suspect a lot of them may be more to do with Victorian whimsy than historical accuracy. Oh Jo, this is wonderful. I love the Great Hall. The Duke was quite a character! Thank you, Susan! I know, I loved the Great Hall, too. It’s magnificent! What I love about Doune is that it’s pretty much unchanged and there are no modern layers to peel away. It’s people like the Duke of Albany that make history so fascinating, although it’s easy to say that from a safe viewpoint! Thank you, Lynne, and I hope you can go there because you’ll love it! It’s just as you say – easy to imagine people living and staying there, even though it’s over 600 years old. Amazing! It’s everyone’s idea of a ‘proper’ castle, or at least mine! The Monty Python sketch is priceless. it’s a lovely castle. I really like the monty python connections. My favourite fact about it was that Monty Python were intending to use a number of castles, but Scottish Heritage decided at the last minute that it wasn’t in keeping with the honour of Scottish castle, as Doune isn’t one of theirs it stood in for every castle apart from Argghhhh. Really fascinating history thanks for the detail. Thank you, I didn’t know that! So that explains their use of Castle Stalker as well. Really glad you liked it! I’d love to see Castle Stalker too. It’s a very romantic-looking place, so picturesque! I’d love to look around it – they offer a handful of boat trips in the summer, and that’s on my list to do! Thanks for this Jo! We visited in 2012 (from Canada) and met the woman who made many of the costumes for the Monty Python movie. Her fav was the outfit worn by the three headed knight. She said there was absolutely nothing to do in Doune at night so the crew, who was staying at the only hotel in the village, made their own fun – which usually got out of hand. 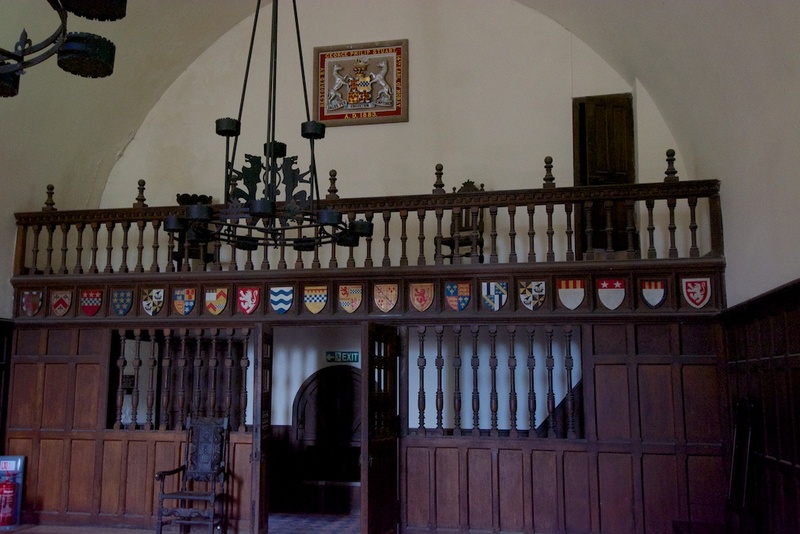 We were also told that the table and chairs in the Duke’s Room were made from the old oak ‘hanging tree’ that had stood in front of the castle. Nice ghoulish touch if this is true. Other than my husband and I there was only one other visitor while we were there. It made for an incredible photo opportunity – especially after we’d experienced the crush and line-ups at Stirling and Edinburgh castles.